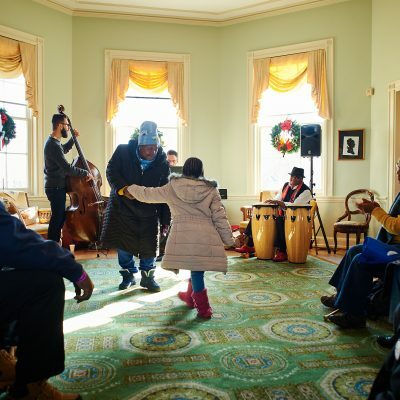 Join us as the historic houses showcase the many talents of the neighbors that live near and around Fairmount Park. Enjoy a day of entertainment while taking in the beauty of the houses decorated for the holidays. Participating historic houses include Cedar Grove, Laurel Hill Mansion, Lemon Hill Mansion, Historic Strawberry Mansion and Woodford Mansion. All houses are located within East and West Fairmount Park in Philadelphia. Visit holidaysinthepark.com/your-visit and scroll down for an interactive Google map to get directions to each of the houses. Admission is $8 per person per house. Children 12 and under admitted free. Simply present your ticket or pass at any one of the 5 participating houses listed above for entry. Discounted passes available for $30, which include entry to all 5 participating houses as well as house to house transportation via the Holiday Houses Loop powered by PHLASH.More info at holidaysinthepark.com/take-philly-phlash/.